For those of you who ain't interested and I for one can't blame you, the new shopping development has salt all over its brickwork. Putting aside the fact that this means the bricks are substandard and we have damp in the brickwork before a single shop has begun to trade, we are now blighted by another problem. It's an all to predictable problem that often emerges when you've salt deposits all over the bloody walls. It allways happens. Simulacra, or as its better known, bloody apparitions. 'Rubbish', I said, 'I know rubbish when I see it and this is rubbish'. Mind, I can understand the fools seeing this as a sign. It's clearly a woman and to be fair it does look like a biblical Icon but I told them, 'I've read the New Testament from front to cover and not once has the good book mentioned that either of these two women were keen participants in athletics'. This salty image clearly depicts a woman pole vaulting over a horizontal bar, wearing a sports bra and clutching a vaulters pole and her skirts, and whilst I accept it could be a genuine apparition, I'd need to hear some seriously compelling evidence to convince me that Mary Magdalene or The Virgin Mary were ever active competitors in Judean sporting events. We don't want lepers, people with headlice and Ricketts tipping up here and draining our already overwhelmed public services, so I say, lets get this salt off the walls before our local economy takes another hit and we become the latest place for these bloody pilgrims to visit. This is a very serious subject, Bobby. We would all do well not to dismiss this vision. If Christ himself can appear on a piece of toast, then why not Mary Magdalene on the salt covered walls of the OLM?? Airport for Hereford anyone...?? To cope with the influx of curious visitors?? I was quite looking forward to a real modern shopping centre, I am disappointed with the amount of bricks and lack of glass to be honest another opportunity to modernise Hereford gone. I have been pondering this for a while now. I think our only option is to collectively pray to the God For Household Seasoning,that this vision disappears! Realistically, we are never going to get an airport. Worse still, we don't have any toilets!! No. This just isn't going to work in our favour. Can you imagine the reviews on Trip Advisor???? The mind boggles....!!! I must say, I agree with whoever said the other day that it looks like a factory. Those big grey slates on the sides facing the roundabouts - I assume they are temporary and will be replaced with glass windows looking into the store/s? It's definitely a prison Biomech! HMP Hereford, awaiting the first guests! King Bobby, once again, has wonderously opened all our eyes. The curved stained brick facade facing the Tesco roundabout is, indeed, a mystical symbol. Hereford is surely destined to become the 21st century Walsingham. Supermarket worshippers from across the country will come here in pilgrimage (with their own trolleys) to look up to venerate the salty effigy of Saint Tesco of Wonga and flowers - greater even that those left in memory of the Blessed Diana - wil bestrew the Tesco roundabout. Not that keen on all those bricks either but you cannot please everyone I for one would of hated modern glass buildings on that site. Judging by the quality look of those bricks Will, you may not have to start picking...they may well appear all by themselves!! If it turns into a raspberry soon as did the poor Old Maylords I sort of hope that we can buy the complex off of Stanhope, British Land et al (or lease at Â£1 for 250 years) and turn it into our university. Keep the cinema though and maybe Waitrose, maybe even Debenhams. Oh bugger, who am I kidding, if Jett from Gladiators opens it I'll be there on day 1. I won't be proud of myself though. It's the Walk Of Shame for you John! Hang your head, and start moving! If King Bobby has any say in the matter,and that is a very big if,only The Lovely Liz Hurley will do! They have "history" as they say!! Salt-leaching bricks seem to be common these days as developers apparently seek to cut costs. They certainly don't improve the look of the Great Wall of Hereford. John, I'd just keep the cinema. Not impressed by either Waitrose or Debenhams. Have you ever tried returning a faulty toaster to Debenhams? I didn't even want a refund, just an exchange! Turning the site into a university is a good idea. Ok, keep cinema only, Debenhams will rue the day they failed to honour their faulty toaster warrantee. We need Debenhams to be the library for the new university in any case. Has any read that Hereford was very nearly made a university before Cambridge and Oxford but the city fathers decided against it? I am sure I read this somewhere once but can't google the info now! Mmmm, not sure if I remember that far back John - I'm old, but not that old!!!! @ Ragwert: "...would of hated..." should, perhaps, have been "...would have hated..."? But then I'm forgetting: you were once a member of the council's thrusting Media Communications Unit, weren't you? Well, if Jet ever comes up my path delivering my weekly Admag, Im going to tell her two things. Firstly, get yourself a decent agent. This is no route back to superstardom and, in future, when you tip toe up my path carrying my Admag dress more appropriately whilst doing your paper round. Bloody celebrities! Last night I was laid in bed when all of a sudden, tap, tap, tap on the bedroom window. I thought, 'funny. Whoever this visitor is they've got a bloody long ladder because I sleep on the fourth floor'. I opened the curtains and guess who it was clinging onto my bloody drainpipe? Bloody Liz Hurley! I said, 'clear off Hurley Im kneading dough in the bakery in the morning and I've gotta get some sleep.' She said, ' Let me in. I can't keep my hands off you'. This is a true reflection of the drivel and tripe we have come to expect from the King of Codswallop! Excellent, the toady tories on the back foot and the return of the bizarre love triangle that is b47, Liz and a slab of dough â€¦ things are looking up! Never a truer word spoken...or typed Two Wheels!! 1. The big squares of grey slats on the wall facing Tesco roundabout - are they temporary until windows are put in or is that how they will stay? 2. The slanted roofing at the same end of the building, given that this is, roughly, where the sun rises, will these slopes be covered in solar panels? 3. The newmarket pub, it's kind of an old shabby building stuck in the middle of the new buildings, will it be staying or will it be removed? Can't help with the first two questions, Biomech. The third question relates to the pub - I believe this is listed, so is staying. Bobby, the thought of Liz and Shane shimmying up your drainpipe kept me awake last night. I can see Shane having the upper body strength to heave himself up to your fourth floor bedroom...but Little Liz?? Are you quite sure it wasn't Shane tapping at your window, and Liz was hanging onto his ankles, crying "Come back to me, this fool will only break your heart!!" This is how it all happened! One day, when I was a lad I was running up the High Street being chased by a woman who wanted her purse back. As I hurtled toward the Bakery, the proprietor jumped out in front of me and shouted, 'hide in here fat face'. Keen to escape this snaggle toothed harbinger of gloom I raced inside the shop. Once inside, the Baker fell to his bloody knees, raised his head toward the heavens and cried, 'it's him. The one who's coming was foretold'. He shrieked, 'show me your hands'. Well! What could I do? Keen to avoid this woman who had now armed herself with a Cattle Prod, I showed him what he wanted me to show him. Nothing else mind. I'll not have it said I showed him anything else and anyone who does say I showed him more than my hands, wasn't there and they are a liars and an embellishers of this codswallop. Gazing at my hands and still on his knees, he looked up at me and said, 'you are the one. Have you ever considered a career in kneading dough Your a natural!. He then quickly wrapped an apron around me, dragged me into his bakery, produced a huge tub of dough and cried, 'start kneading'. So I did. I very quickly kneaded sixteen lumps of dough and presented each lump for the Bakers inspection. Once again, overwhelmed by emotion, he fell to his knees and yelled, 'I've seen kneaders come and I've seen kneaders go and never have I witnessed such natural talent'. And so I became a kneader of dough. He agreed to pay me and we mutually agreed a trial period of forty bloody years when, if I delivered what he expected me to deliver, I'd get a day off every bloody Shrove Tuesday. One morning, several years later with that bloody woman long since dead and buried, I was in the process of kneading my twenty millionth lump of dough when there was a tap, tap on the window. It was Hurley! I said, 'clear off Hurley. Im kneading dough and I've a tray of bread baking at a thousand degrees'. She said, 'Come away with me. Leave this place of burden and join me in a life of Film Premiers, red carpets and exotic holidays'. I told her straight, 'clear off Hurley. Take your temptations of splendour and leave me be. I'm a kneader of dough, your an international superstar and I'll be damned if I give all of this up for unimaginable bliss with you. Now clear off. Go bother someone else.' And that's why I can't get a decent nights sleep. I believe this is listed, so is staying. Well if it's listed it's listed I guess, going to look particularly strange though. Reminds me of those Chinese "nail houses"
"Won't sell up? Enjoy living in the middle of a motorway! 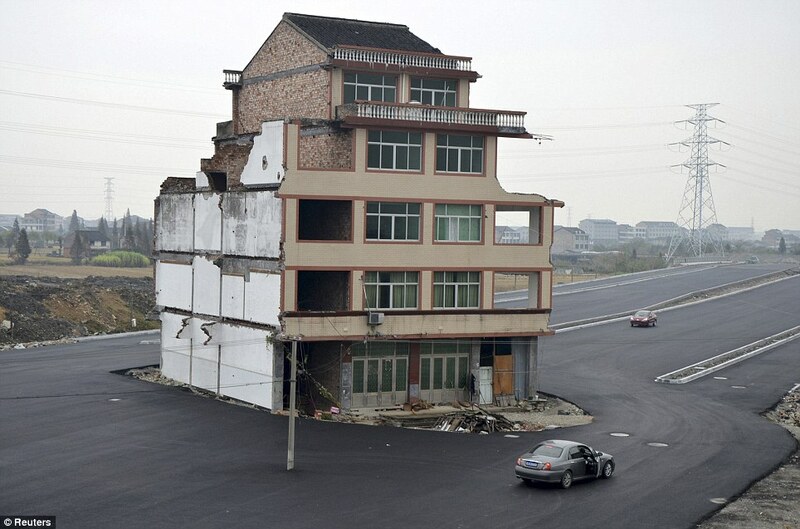 Road is built around a house after elderly Chinese couple refuse to move"
Now it all becomes crystal clear! Actually, I had to contact Liz Hurleys agent about an entirely different matter - see Poll Name Thread - and whilst chatting about Liz's availability, he dropped into the conversation that both Shane and Liz were huge fans of pole dancing, and could now writhe up and down anything that resembled a pole! "Especially drainpipes!" came the reply......."Liz gets a leg up from Shane, then they're both away"
So I am very sorry that I ever doubted you Bobby! I will never question again! It says it's going to be a zizi restaurant.Anyone noticed the Oak framed building going up by Multi story car park? Yes, I read about this - it's going to be the Gateway by all accounts. Soooo, a new build that resembles a prison, a listed pub and an oak framed gateway....anybody else think this is a bit of an odd mix? I'm sure with the addition of a few hanging baskets we'll all think it looks just lovely.........! !